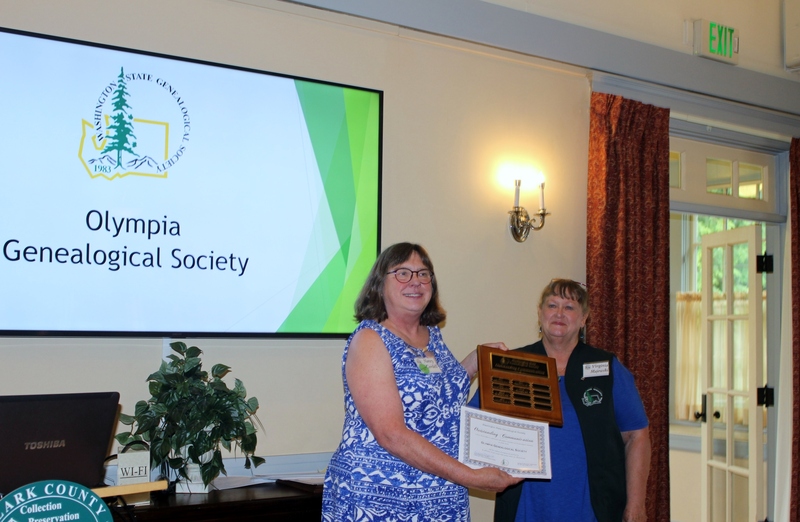 In an announcement made at the WSGS Annual Meeting on 26 May 2018, Ann Olson from Olympia was awarded the WSGS President’s Award for Outstanding Achievement. The award, made by WSGS President Virginia Majewski, is designed to single out that rare individual, society or organization that has demonstrated exemplary service above and beyond expectations. Founding member of the Olympia Genealogical Society 44 years ago. Has served in every board position; more than once in many cases. Organizes and teaches a beginning genealogy course at the local library. Affectionately called the “lead-off batter and team captain” of the society. Ann’s involvement in her community is broader than genealogy. For example, she is a docent at the Governor’s Mansion; member of the Daughters of the Pioneers (including being president of her local chapter); and registrar of the local DAR, where she’s been a member for more than 30 years. When her children were growing up, Ann was active in the PTA, including being state president and national vice-president. Ann exemplifies what the President’s Award stands for: long-term, consistent service in genealogy and in the community. Congratulations to her! Many thanks are extended to the Clark County Genealogical Society for hosting the WSGS Annual Meeting and Awards Event on Saturday, 26 May 2018. The annual meeting was held in conjunction with CCGS’s Spring Seminar featuring David Allen Lambert, chief genealogist with the New England Historic Genealogical Society in Boston. During the annual meeting and awards lunch, 30 local society members and 4 teams were recognized with Outstanding Volunteer and Team awards. The volunteers were praised for their commitment and energies to promote genealogy and family history in their local communities. 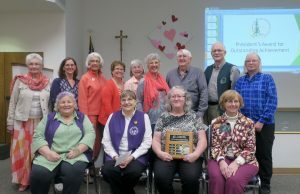 For more about the Outstanding Volunteers, read this blog article. Outstanding Communication – Olympia Genealogical Society for their new website. Check it out!! Outstanding Project — Clark County Genealogical Society for their dedication to digitizing, transcribing and indexing original tax ledgers for the City of Vancouver for the years 1886 and 1891. Eastside Genealogical Society – help paying for “The Photo Detective” Maureen Taylor at a workshop to celebrate the society’s 40th Ms. Taylor will present “Finding Family History in Your Picture Mysteries” on September 15 in Bellevue. Society members will get to attend for free while the public will pay a small fee. Lower Columbia Genealogical Society– to purchase genealogical books to donate to the Longview Public Library for public use. Lower Columbia has generously donated books for a number of years, using money from membership dues and their coffee stops. Okanogan Genealogical Society – help purchasing supplies to repair and preserve books holding the “Tonasket Times” newspaper from 1913 – 1952. They use a special archival document repair tape. Each book uses a whole roll of tape. This grant will buy a few rolls of tape to stop the destruction of the collection. Stillaguamish Valley Genealogical Society – help publishing a book on “Early Stillaguamish Valley Schools” in the Arlington Area. It’s taken years to gather historical documents and photographs for this project from the 1800s to the early 1940s and now they’re ready to publish. 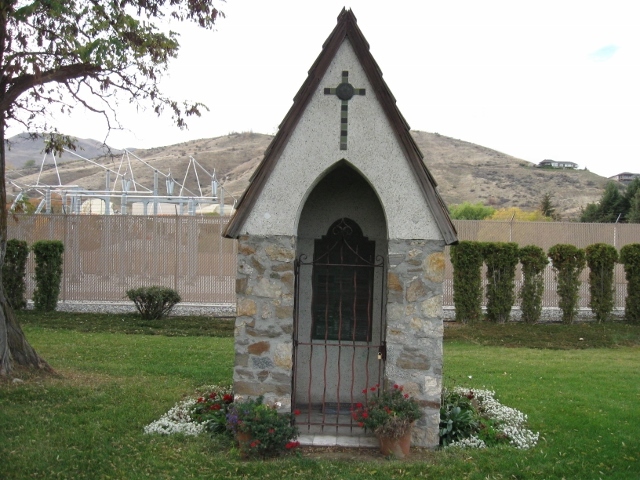 Wenatchee Area Genealogical Society – For the 4th consecutive year, WAGS has applied for an Innovative Grant to promote genealogy in their area. This year, they’re focusing on the digital preservation of family records, library holdings and archival documents. They plan to preserve family histories and archival materials of their society, its members and the community. 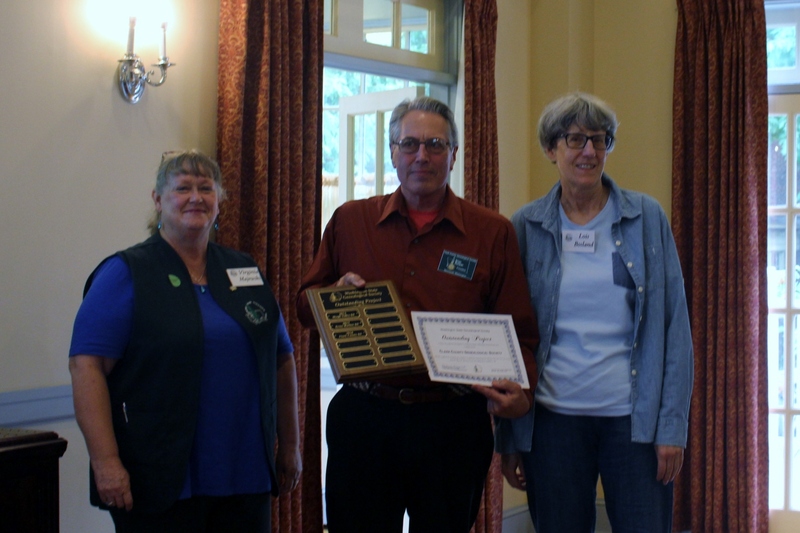 The President’s Award for Outstanding Achievement was presented to Ann Olson of the Olympia Genealogical Society. See separate blog feature. For more photos of the seminar and annual meeting, visit our Facebook page. Does your society have a member who has exhibited long-term, consistent service in the field of genealogy, family or local history, the genealogical community, records preservation or made an important single contribution in those areas that will endure into the future? 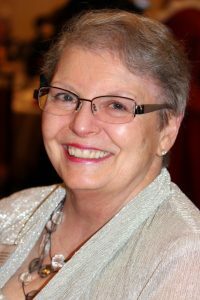 That person (or persons) may be deserving of the Washington State Genealogical Society President’s Award for Outstanding Achievement. The award is designed to single out that rare individual, society or organization who has demonstrated exemplary service above and beyond expectations. The person(s) does not have to be a past president of your society. 2016 – Margie Wilson, Skagit Valley Genealogical Society. Read more about Margie’s accomplishments here. 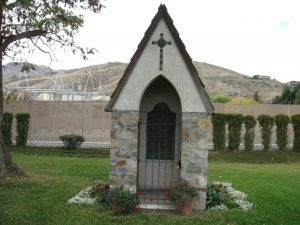 2017 – Joanne Calhoun, Wenatchee Valley Genealogical Society. Read more about Joanne’s accomplishments here. The deadline for this esteemed, competitive honor is 11:59 p.m., Sunday, April 15. Details, including the nomination form and other requirements, are available HERE. The deadlines for WSGS awards to local societies have been set. We are encouraging you to promote your society’s activities and accomplishments by submitting a nomination. Outstanding Communication – The WSGS Outstanding Communication Award is awarded to a local society that promotes its society and/or genealogy and family history to its members and/or the public. The award includes all forms of communication, including websites, social media, newsletters, lectures, videos, podcasts, etc. The nomination deadline is 01 April 2018. The application is available here. Outstanding Project – The WSGS Outstanding Project Award is awarded to a local genealogical society or organization in recognition of exceptional genealogical or historical projects implemented during the past year. The nomination deadline is 01 April 2018. The application is available here. President’s Award: The WSGS President’s Award for Outstanding Achievement is designed to single out that rare individual, society or organization who has demonstrated exemplary service above and beyond expectations. The nomination deadline is 15 April 2018. The nomination form and additional details are available here. and teams who have been identified by their local genealogical organization to be honored for exceptional efforts. The deadline to submit the name of a society’s individual or team is 15 Feb 2018. More information about the Outstanding Volunteer and Team Awards is available here. For more information, contact Roxanne Lowe, Interim Chair, Recognition Committee at roxanne@thekeeffes.com. Many thanks are extended to the Yakima Valley Genealogical Society for hosting the WSGS Annual Meeting and Awards Event on Saturday, 22 April 2017. The annual meeting was held in conjunction with YVGS’s Spring Seminar featuring Jay Fonkert, a Minnesota-based genealogy researcher, educator, and writer who focuses on nineteenth-century Midwest research. Nearly 90 people attended the seminar and annual meeting. WSGS Vice President Donna Phillips presenting Outstanding Volunteer Award to Patricia McCann Manning from the Stillaguamish Valley Genealogical Society. Region 6 Representative Janet McKinnon presenting an Outstanding Team member award to husband Mikal McKinnon for his work on the Tri-City Genealogical Society’s Library Recataloging and Renumbering Team. During the annual meeting and awards lunch, nearly 40 local society members were recognized with Outstanding Volunteer and Team awards. 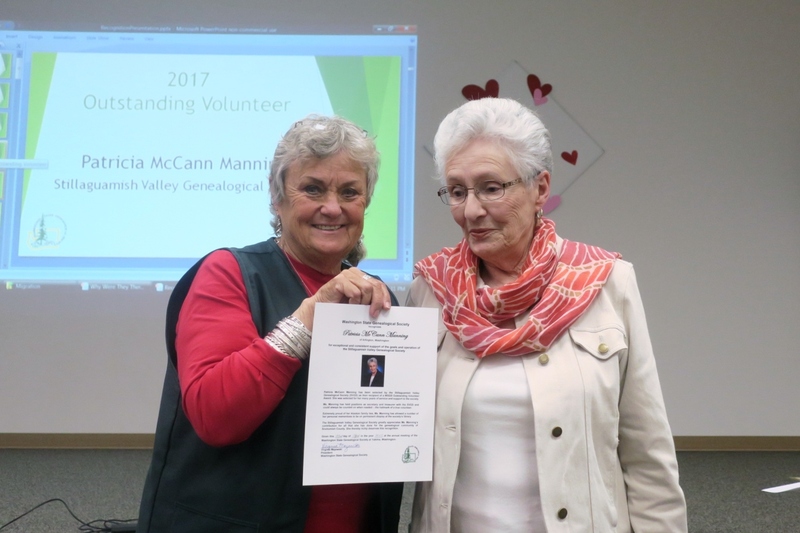 These volunteers were praised for their commitment and energies to promote genealogy and family history in their local communities. Outstanding Communication – Whitman County Genealogical Society for its newsletter filled with personal stories, photos and “snippets from the olden days.” Their newsletter started on in 1984 with just a few pages focusing on Whitman County. Today the newsletter is 10 pages with a continued focus on the county, but has expanded to include a wide variety of genealogy-related articles, designed to educate and entertain the society’s members and other readers. Special acknowledgement was extended to newsletter editor Judy Standar McMurray, with assistance from Monica Bartlett Peters. Outstanding Project — Grays Harbor Genealogical Society for the preservation of thousands of records from a 100-year-old funeral home that closed suddenly. The records were in danger of being lost or discarded until the society stepped in. Twelve boxes of paper were organized, scanned, cataloged and indexed into 19 binders. While this was an effort tackled by almost half of this small society, special recognition was extended to Cathy Cook, Gary Parfitt, Marlene Payne and Bonnie Johannes. Five local societies were awarded Innovative Grant Awards. See separate blog feature. 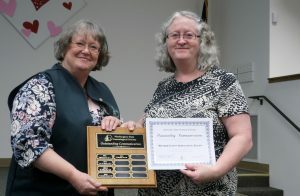 The President’s Award for Outstanding Achievement was presented to Joanne Egbert Calhoun of the Wenatchee Area Genealogical Society. See separate blog feature. In an announcement made at the WSGS Annual Meeting on 22 Apr 2017, Joanne Egbert Calhoun was awarded the WSGS President’s Award for Outstanding Achievement. The award, made by WSGS President Virginia Majewski, is designed to single out that rare individual, society or organization that has demonstrated exemplary service above and beyond expectations. And Joanne certainly exemplifies that. 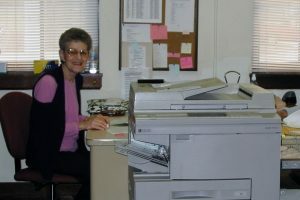 Joanne has been a member of the Wenatchee Area Genealogical Society (WAGS) and its predecessor since 1945, and is often called the “glue” that has kept the society active and strong. 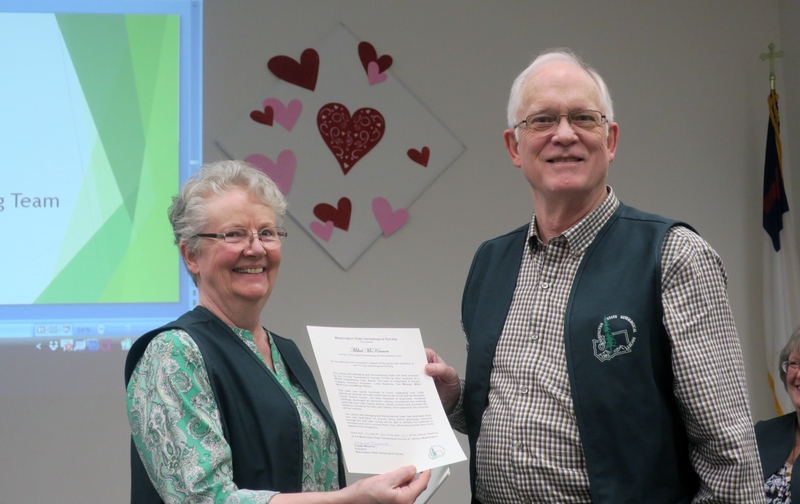 Her willingness to serve as WAGS Treasurer for over 40 years, as well as president for three years, demonstrates exemplary service above and beyond expectations. In determining the award recipient, President Majewski said, “There were some great nominations for the President’s Award and all are certainly deserving, but Joanne stood out as demonstrating a lifetime of contribution to the community.” We honor her accomplishments. The Washington State Genealogical Society wants to recognize your good work! We know your society has great members doing great work — and we’d like to celebrate that. Below are the deadlines (and website links) for our recognition awards and special programs. The name of your Outstanding Volunteer or Team – just the name(s) – is due to Roxanne Lowe by 15 Jan. If that date is difficult for you because of your society meeting date, let her know — something can be worked out. Nominations for Outstanding Project & Outstanding Communication awards are due 01 Feb. If you’ve got a society member who has been exceptional for a sustained period of time, consider nominating him/her for the President’s Award for Outstanding Achievement. That nomination is due 15 Feb. Innovative grant applications are due 01 Mar. We want to help you with your special projects! If you’re planning a workshop, seminar or special program and need some financial assistance, consider the Education Assistance Fund, a revolving fund designed to help you deliver a top-notch event. For more information about the WSGS recognition awards, contact Roxanne Lowe at roxanne@thekeeffes.com. Outstanding Communication – The WSGS Outstanding Communication Award is awarded to a local society that promotes its society and/or genealogy and family history to its members and/or the public. The award includes all forms of communication, including websites, social media, newsletters, lectures, videos, podcasts, etc. The nomination deadline is 01 Feb 2017. The application is available here. 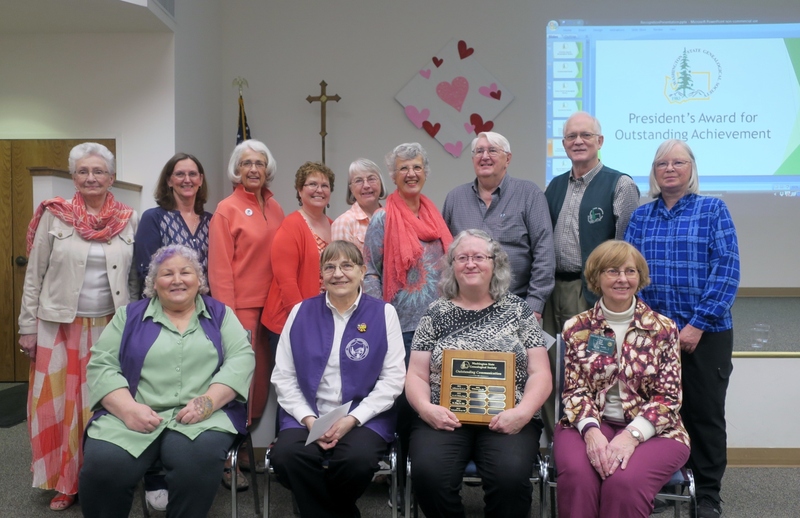 Outstanding Project – The WSGS Outstanding Project Award is awarded to a local genealogical society or organization in recognition of exceptional genealogical or historical projects implemented during the past year. The nomination deadline is 01 Feb 2017. The application is available here. President’s Award: The WSGS President’s Award for Outstanding Achievement is designed to single out that rare individual, society or organization who has demonstrated exemplary service above and beyond expectations. The nomination deadline is 15 Feb 2017. The nomination form and additional details are available here. For more information, contact Roxanne Lowe, Chair, Recognition Committee at roxanne@thekeeffes.com. Societies: The deadline for WSGS’s special recognition awards is Saturday, May 1, 2016. Societies are urged and encouraged to submit nominations for Outstanding Communication, Outstanding Project and the President’s Award for Outstanding Achievement. For more information and nomination information, click on the links below. •Outstanding Communication – Recognizes the importance of how local genealogical societies or organizations communicate. Includes all forms of communication, including websites, social media, newsletters, lectures, videos, podcasts, etc. 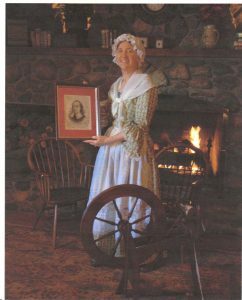 •Outstanding Project – Awarded to local genealogical society or organization in recognition of exceptional genealogical or historical projects implemented during the past year. •President’s Award for Outstanding Achievement – Recognizes that rare individual, society or organization who has demonstrated exemplary service above and beyond expectations. There’s also another society support your group may want to consider: the Education Assistance Fund — funding assistance to societies so they can provide quality educational events such as conferences, workshops, seminars and programs. Questions about any of this? Contact Roxanne Lowe, WSGS Recognition Chair.